Vitus Jonassen Bering (also, less correctly, Behring) ( August 1681– December 19, 1741) was a Danish-born navigator in the service of the Russian Navy, a captain-komandor known among the Russian sailors as Ivan Ivanovich. He was born in the town of Horsens in Denmark and died at Bering Island, near the Kamchatka Peninsula. After a voyage to the East Indies, he joined the Russian Navy in 1703, serving in the Baltic Fleet during the Great Northern War. In 1710– 1712 he served in the Azov Sea Fleet in Taganrog and took part in the Russo-Turkish War. He married a Russian woman, and in 1715 he made a brief visit to his hometown, never to see it again. A series of explorations of the north coast of Asia, the outcome of a far-reaching plan devised by Peter the Great, led up to Bering's first voyage to Kamchatka. In 1725, under the auspices of the Russian government, he went overland to Okhotsk, crossed to Kamchatka, and built the ship Sviatoi Gavriil ( St. Gabriel). 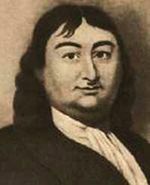 Aboard the ship, Bering pushed northward in 1728, until he could no longer observe any extension of the land to the north, or its appearance to the east. In the following year he made an abortive search for mainland eastward, rediscovering one of the Diomede Islands ( Ratmanov Island) observed earlier by Dezhnev. In the summer of 1730, Bering returned to St. Petersburg. During the long trip through Siberia along the whole Asian continent, he became very ill. Five of his children died during this trip. Bering was subsequently commissioned to a further expedition, and returned to Okhotsk in 1735. He had the local craftsmen Makar Rogachev and Andrey Kozmin build two vessels, Sviatoi Piotr ( St. Peter) and Sviatoi Pavel (St. Paul), in which he sailed off and in 1740 established the settlement of Petropavlovsk in Kamchatka. From there, he led an expedition towards North America in 1741. A storm separated the ships, but Bering sighted the southern coast of Alaska, and a landing was made at Kayak Island or in the vicinity. Under the command of Aleksei Chirikov, the second ship discovered the shores of the northwestern America ( Aleksander Archipelago of present-day Alaska). These voyages of Bering and Chirikov were a major part of the Russian exploration efforts in the North Pacific known today as the Great Northern Expedition. Bering was soon forced by adverse conditions to return, and he discovered some of the Aleutian Islands on his way back. One of the sailors died and was buried on one of these islands, and the group was named after him (as the Shumagin Islands). Bering became too ill to command his ship, which was at last driven to refuge on an uninhabited island in the Commander Islands group (Komandorskiye Ostrova) in the southwest Bering Sea. On 19 December 1741 Vitus Bering died here of scurvy, along with 28 men of his company. This island bears his name. A storm shipwrecked Sv. Piotr, but the only surviving carpenter, S. Starodubtsev, with the help of the crew managed to build a smaller vessel out of the wreckage. The new vessel had a keel length of only 12.2 meters (40 feet) and was also named Sv. Piotr. Out of 77 men aboard Sv. Piotr, only 46 survived the hardships of the expedition which claimed its last victim just one day before coming into home port. Sv. Piotr was in service for 12 years, sailing between Kamchatka and Okhotsk until 1755. Its builder, Starodubtsev, returned home with governmental awards and later built several other seaworthy ships. The value of Bering's work was not fully recognized for many years, but Captain Cook was able to prove Bering's accuracy as an observer. Nowadays, the Bering Strait, the Bering Sea, Bering Island, and the Bering Land Bridge bear the explorer's name.